The removal of asbestos materials is highly specialised. 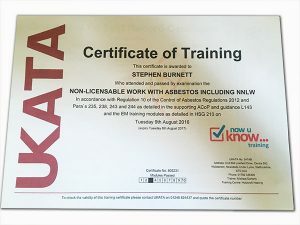 At CMS contractors, we have staff fully trained by UKATA in Non-licensable work with Asbestos, including NNLW. CMS contractors will complete the removal of asbestos with great care and attention to detail. We will organise specialist skips to be on site for duration of the removal process. We operate nationwide in both the public and private sectors on a range of agricultural, industrial and commercial buildings. If you have any queries about asbestos removal, please don't hesitate to contact us.